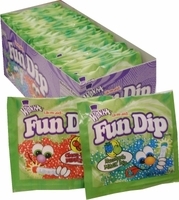 Buy wonka fun dip in single flavor pouches. Fun dip is also known as lik m aid. Sour powder sugar complete with a dipping stick. Each box has an assortment cherry and blue raspberry flavors. This is just one of the many nostalgic candies available from Willy Wonka.